One wonders what model manufacturers are thinking sometimes. Cars like the Porsche 962 and Mazda 787 keep getting made over and over again in 1/43 scale. I get it; model manufacturers are repurposing old tooling. Kind of like getting something for nothing cost-wise. Only there’s only so many of these you can ever possibly sell! Then there’s the model every Indy 500 collector would purchase. The Jim Hall, Al Unser, Indy 500 winner Chaparral Lola T500. You can obtain every LeMans winner in 1/43, even the one-timers. Indy cars just don’t get made all that often. That is getting better, mainly through the efforts of Replicarz and Spark. But the growing selection is slow in coming. Spare a thought for a car that made history, doing what no other car has ever done before or since. To this day, it still has never been properly modeled EVER in any scale. Outside of an obsolete transkit in 1/25 scale, nothing. It also is the only car/driver/team to ever win the impossible-to-win USAC Triple Crown, consisting of the Indy 500, Pocono 500 and Ontario 500. The Jim Hall, Al Unser, Indy 500 winner Chaparral Lola T500. His driving career had been long over, and the Can-Am series long dead by 1978. His legendary white Chaparral cars, the pride of the USA, here and overseas, had come to a glorious end with the 2J sucker car and a Camaro in Trans-Am in 1970. Diverting his on-track activities as a Lola owner, with Carl Haas, to the burgeoning F5000 series in 1973, his team dominated the series. The F5000 series, however, was mercurial in nature. From F1 competitor to the ashes of racing history did not take long. F5000 soon was rebodied to become the new-format Can-Am series for 1977. Haas/Hall would convert their Lola T332 cars to the new single-seat Can-Am spec for 1977, where they dominated again for several years. However, the lure of the Indianapolis 500 proved too much. Hall ordered a Lola T500 from importer Carl Haas, and hired Al Unser Sr. to drive. Turbo Cosworth DFX powered, their collective Indy adventure didn’t look all that impressive. Tenth, out of fuel at Phoenix, 3rd at the Ontario Twin 200s, no shows at College Station or Trenton. Al Unser lined up 5th on the grid, a little over 1 second a lap slower than pole man Tom Sneva. Unser was quickly up to third, and took the lead for the first time on lap 76. He led for 32 laps, surrendering the lead for 3 laps after a pit stop. Back in the lead for 69 laps, he pitted and was back in the lead just 1 lap later! He then led for the final 20 laps to win his third Indy 500. It was the first for Jim Hall, on his first try at Indy with a car nobody else was running…or wanted! Unser led for 121 laps, way more than anyone else. He was never impressed by the Lola T500. Its handling was indifferent. However, the Lola was reliable, something quite rare at this point in Indy history. It had engines built by the venerable Franz Weis, who had been building winning engines forever. The cars were prepared in the shops of Jim Hall, who knew a thing or two about finishing and winning with Lolas. Lastly, Al Unser was driving the Lola T500, at the peak of his game. Starting second at Mosport’s roadcourse, he crashed out on lap 31. Milwaukee was a mediocre 8th start and finish. Then, Unser won at the Pocono 500, after starting 10th, leading “just” 65 laps! All of a sudden, winning the USAC Triple Crown of races seemed possible it was whispered around the paddock. The Triple Crown was thought to be impossible to win; the cars were way too fragile and dangerous for that to happen, right? 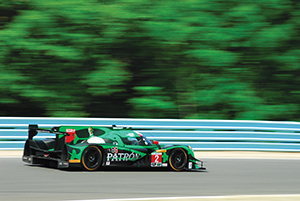 The Lola finished just 17th with a blown engine at Michigan, after again starting 10th. Disappointment followed at Atlanta, out of fuel 6 laps from the finish, leading no laps. Texas World was another 17th, out with suspension problems. Milwaukee yielded a 6th at least, also leading no laps. The California 500 placed the Jim Hall, Al Unser, Indy 500 winner Lola T500 in the pantheon of great race cars. Not because it handled great, or blazed new technology, or went 40mph faster than anyone down the straights. No, it simply finished. 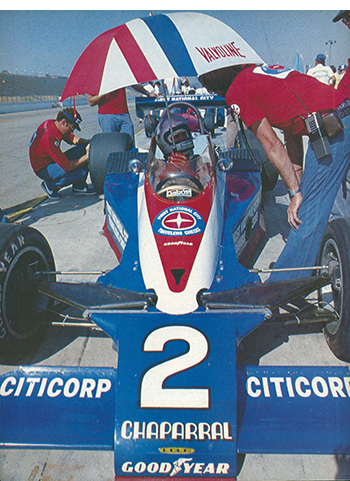 The Lola T500 was one of only 5 cars that finished the California 500 in 1978 (above, left). Unser was 5 laps ahead of second at the end. Third did not finish. Unser and Hall and that truck of a race car Lola T500 had done the unthinkable: it had won the 3 biggest 500 mile races of the year! Nobody realized it at the time, but this would never happen again. After Ontario, the Lola finished 17th, 4th, 10th, 15th and 5th to close the season. I’m not sure it mattered to anyone on the team. The miracle car Lola T500 has never been modeled. That’s really unbelievable. A sin, really. How did the Lola T500 escape the notice of literally every 1/43 scale model manufacturer ever, much less any other scale? Okay, Colin Fraser of Formula Models wanted to make the model and actually listed it, but other projects have waylaid the Lola from creation by his firm probably forever. So many Chaparrals, Chaparral-run cars, and Jim Hall-run cars have been modeled. Almost every iteration of the white Chaparral sports cars, Hall’s Maserati and F1 cars, the “other” winning Chaparral Indy car (the 2K), F5000 and Can-Am winning Lolas have been modeled. Even non-winning Chaparrals, Camaros and a McLaren have been modeled. But, not the Jim Hall, Al Unser, Indy 500 winner Chaparral Lola T500. Repent Replicarz and Spark! Repent, make the Lola T500 model and save yourselves, I say! 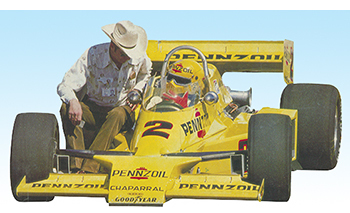 There was also a Pennzoil version (above, right) early in 1979 while awaiting the arrival of the new Chaparral 2k, both run in the newly formed CART series. The Jim Hall, Al Unser, Indy 500 winner Chaparral Lola T500. More Indy car model stories here. With thanks to Grand Prix Models, Colin Fraser (Formula Models), Carl Haas Automotive and the Chaparral website for their help with this article. Top photo courtesy John Rettie. Ontario photo courtesy Larry Roberts.